The Auschwitz Institute for Peace and Reconciliation (AIPR) is proud to announce that it has signed a Memorandum of Understanding (MoU) on the Prevention of Genocide and other Mass Atrocities with the East African Community (EAC) on May 23, 2016. 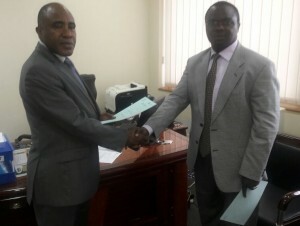 The MoU on the Prevention of Genocide and other Mass Atrocities was signed at the offices of the East African Community in Arusha, Tanzania. Dr. Ashad Sentongo, the Director of AIPR’s Africa Programs, signed on behalf of the Auschwitz Institute, while Dr. Richard Sezibera, Secretary General of the EAC, signed the document on behalf of the East African Community. The implementation of peace and security initiatives including education programmes on prevention of genocide and other mass atrocities for EAC technical staff and key stakeholders in EAC Partner States, promotion of research, production of learning resources and exchange of information. In the coming weeks, AIPR will hold consultation meetings with EAC officials regarding proposals made to implement training programs for staff of the Secretariat as well as officials from the six EAC member countries. This partnership will be particularly effective in advancing AIPR’s goal of creating stronger linkages between institutions for prevention in the Great Lakes Region and leveraging past experiences and lessons learned, as well as the sharing of best practices, from States in East Africa. These programs will look to build on the recent collaborative work undertaken between the two organizations to hold capacity building training seminars for National Mechanisms for Genocide and Mass Atrocity Prevention in Tanzania, Uganda and Kenya.